Active over at Shaw Brothers during 3 decades, with roles in among others The Heroic Ones and Police Force (both by Chang Cheh), it seemed like the modern, the urban, the gritty fit well with Wong Chung's taste in movies. Hence his directed movies at Shaw's such as The Informer and Murderer Pursues being cut of that big mold. 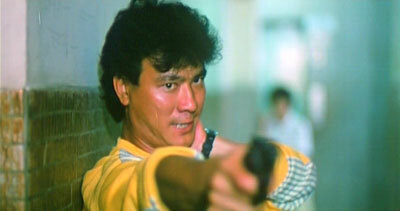 Also starring Danny Lee, who had wandered a bit aimlessly at Shaw's before scoring with his own directed Law With Two Phases (which he also won Best Actor at the Hong Kong Film Awards for), it would make even more sense that Wong and Lee would reunite for Cop Of The Town in 1985. Also continuing their respective work behind the scenes (Lee received the credit of Planner), arguably it seems like a dual work but an exciting dual act one nonetheless. Getting much mileage out of creating less of a studio bound vehicle, Wong Chung aims for a street realism that has equal parts to do with carrying out the dangerous duties that come with the job as much as it's about kicking back to focus more on horse bets for instance. Pretty much separating the storylines of Lee's Romeo and Wong Chung's Bill, the former has no problem switching on his violent persona. A skill that is a bit too good for his own good but at times maintaining his lighthearted stance even amidst danger of a psycho attacking makes for a character potentially never destined to be the perfect cop. A welcome stance in the material as Danny Lee would go on to play on more occasions than a few more of the perfect street cop or superior. Wong Chung takes his own story into a mentor relationship with his new superior where it's about that little saying of "choosing your battles". In this case meaning regulations are there for a purpose but following it only 60-85% doesn't equal status of poorly executed duty (Feng Shui and fortune telling must be taken seriously though!). You kick into high gear at suitable moments and could be allowed to perhaps go lazy a bit when it comes to the paperwork. Wong Chung's calm and likeable nature as a veteran being lesser ranked than his female superior provides the sub-strength of Cop Of The Town that treats its main story with honed focus as well. Wong Chung has a very accomplished eye. That's not saying we get nor need an eye for the creative and stylish but his canvas containing real locations on the streets of Hong Kong gets rendered in a fashion that propels his storytelling nicely. There's no forced gloom here but one of Wong's skills has to do with quickly transforming that light, bright setting into one of danger (1*). This representing the start of Ricky Yi's descent into madness (that unfortunately gets taken to over the top levels come ending time), the feel of this fool of a character is fairly tense. We know he will snap for sure but the wait to see how much blood will be shed as he roams his way through regular people and cops while hoping to get Annie is a driving force for Cop Of The Town that cements Wong Chung's intended structure and pace. Threatening to have the authorities shut down the cops rather than the psycho villain as doing your duty is still close to overstepping boundaries, what's unusual about Wong Chung's thriller is that it never dips. This is unusual, competent stuff that comes with eye for clarity that in turn becomes quality only looking old because it was made in the 80s. But it's a notable 80s portrayal of real cops getting into real danger and from a filmmaker feeling comfortable creating the street and being part of it. It will feel relaxed, it should feel relaxed. It will also feel violent and it should too. Audio: Cantonese Dolby Digital 2.0 and Mandarin Dolby Digital 5.1. Extras: Star's File (a good biography on Danny Lee covering his career up till the end of the 80s) and trailers for Cop Of The Town, Final Justice, The Law Enforcer and Law With Two Phases. (1) A car chase later on in the film plays out a bit subdued for these kinds of scenes, a choice that works and early there's a wicked car stunt similar to a famous one from Police Story. Jackie Chan's movie came out the month after Cop Of The Town. Make of that what you will.